Sunshine Valley, Corner of 125&D Highway. Orders for Pasteurized whole milk (Not Homogenized, so cream settles) can be left with the store of your choice. Buy your Milk in a glass bottle with a deposit the first time. 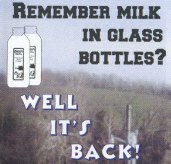 Return your bottle and pay only for your milk the next time.